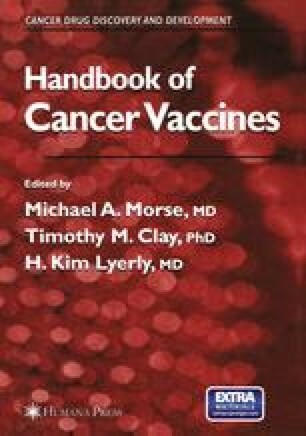 The identification of specific tumor antigens has significantly advanced the field of tumor immunology, in particular, the development of cancer vaccines. Improved understanding of the molecular basis of antigen recognition has resulted in the development of rationally designed tumor antigen—specific vaccines based on motifs predicted to bind to human class I or class II major histocompatibility complex (MHC) molecules. The use of synthetic peptides in cancer vaccines offers practical advantages such as relative ease of construction and production, chemical stability, and a lack of infectious or oncogenic potential (1). Peptides may also allow better manipulation of the immune response through the use of epitopes designed for stimulating particular subsets of T cells. Most importantly, peptide vaccines appear to be effective in generating immune responses to selfproteins (2). Theoretically, immunization to foreign proteins normally elicits immunity to only a subset of potential epitopes, dominant epitopes, whereas other potentially immunogenic epitopes, subdominant epitopes, are ignored. There is evidence that T cells are tolerant to the dominant epitopes of self-proteins, but may respond to the subdominant epitopes (3,4). As many newly defined tumor antigens are self-proteins, peptide immunization may play a key role in the ability to elicit an immune response to tumor antigens.